In most cases, a seller recruits a real estate agent to create a purchase agreement. However, a homeowner may sometimes choose to represent themselves in the transaction without the help of a real estate agent. This is known as a FSBO (For Sale By Owner) situation. If you choose to move forward with the sale, you will be tasked with outlining a purchase agreement with terms and conditions on the sale. Fees are included in the creation of a purchase agreement, but they may be included in the commission fee of the seller. While a firm handshake may have been sufficient in the past to seal a business deal, today’s complex legal landscape mandates that all transactions be confirmed and documented thorough written agreements and contracts. If the seller chooses not to be represented by a real estate agent, having an experienced title company participate in the negotiation, drafting, and review of your real estate agreements and settlement can be a huge help. It may even minimize the risk of costly and time-consuming lawsuits and other disputes in the future. The real estate attorneys at Mathis Title Company are prepared to assist you with all aspects of contract negotiation, drafting and review. 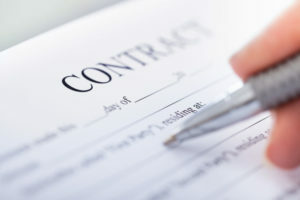 Our knowledgeable and experienced attorneys will work with you through every step of the contract process to ensure that your contracts benefit and protect you. The title agents at our Fairfax title company will also ensure that the title, documents, and transfer of funds are legally binding. Contact our title company agents today to find out more about our contract preparation and review services and learn how we can draw up a purchase agreement on your terms.